So I just returned from an 11 state road trip – where the first stop was Louisville, Kentucky. Now let me start by saying I have been to 45 of the 50 states, and up until two weeks ago, Kentucky was one of the few I had left to hit. Being that we were only in KY for a night, I tried to pack as much sight-seeing in as I could. I didn’t really know what to expect from this state, but in my head I envisioned luscious green fields full of beautiful horses, Sunflowers and lovely Southern accents. Fortunately I was not disappointed by any of those three. The absolute first thing I would suggest for anyone looking to visit Louisville would be to schedule a tour of Churchill Downs. 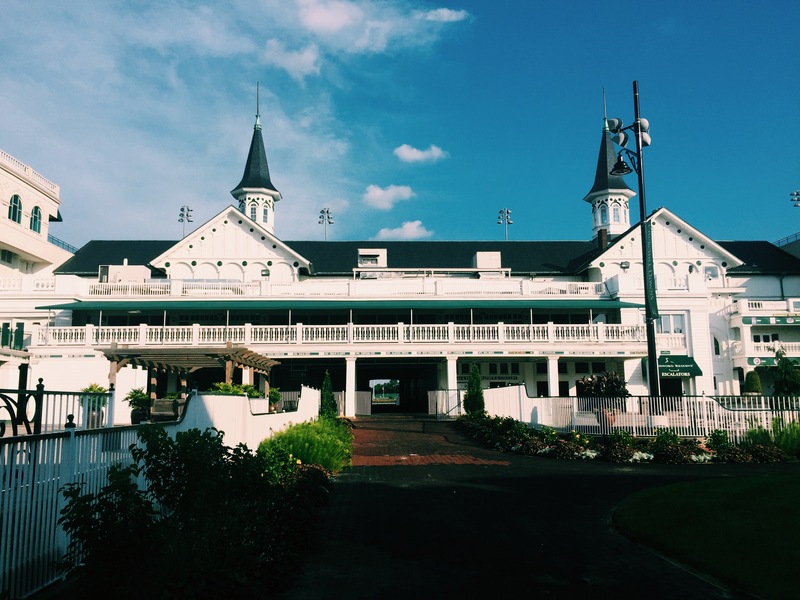 This iconic horse-racing facility not only boasts the privilege of holding the Kentucky Derby, but is hands down one of the coolest places I have seen to date. As soon as you walk through the main gates, you feel the memories and magic that have been made here over the 100+ years. Churchill Downs has a really interesting way of mixing vintage and new, there were moments when I felt as if I was thrown back to the earlier part of the 19th century. We took the moonlight tour, which offered a view of the race track at night. Highly recommended, especially if you are a sunset chaser like myself. Also, be sure to end your time at Churchill Downs indulging in one of their signature Mint Juleps, yum! The second thing I just had to do while in Louisville was of course to sample some of their famous Kentucky Bourbon. I am more of a vino gal, but while in Kentucky that just wasn’t going to fly. We stopped at the historic Brown Hotel to get our fix, but downtown Louisville offers a wide variety of places to pop in and grab a glass. I would suggest hitting up 4th Street, where you can find a slew of bars with live music to accompany. Wherever you may end up, make sure when you are ordering you can answer this one question : Neat, or on the Rocks?